Here in Aberdeen, the apples are ready to pick in late August. This post is late in coming, but I thought you (my online audience) would still enjoy it. I was silently mourning the loss of the wonderful orchard we use to visit in New Jersey to pick apples. Then this amazing opportunity arrived. My wonderful friend Emily (on the left) has a generous neighbor who gave her permission to pick the apples hanging over the wall into Emily's yard ... an offer we could not refuse. picking bags and bags of apples. 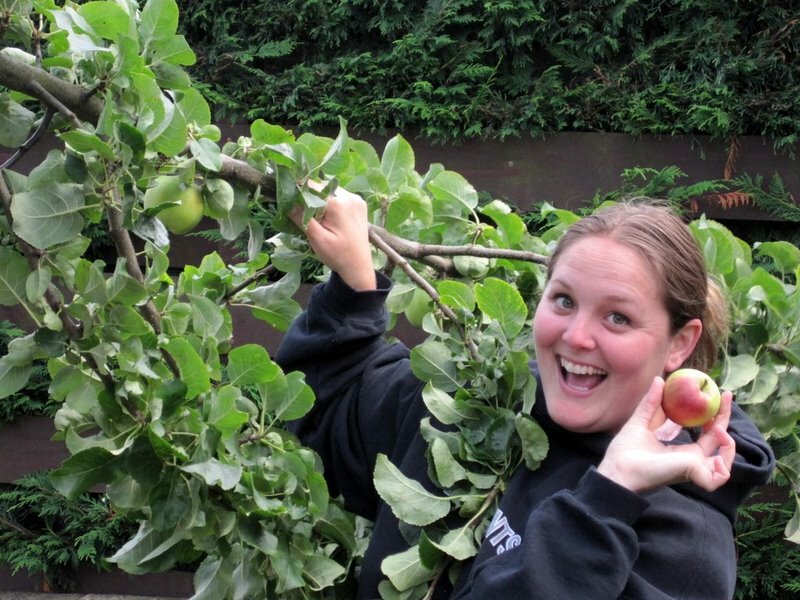 I was holding branches down to help reach some of the higher apples. There were a few at the top that were so beautiful. 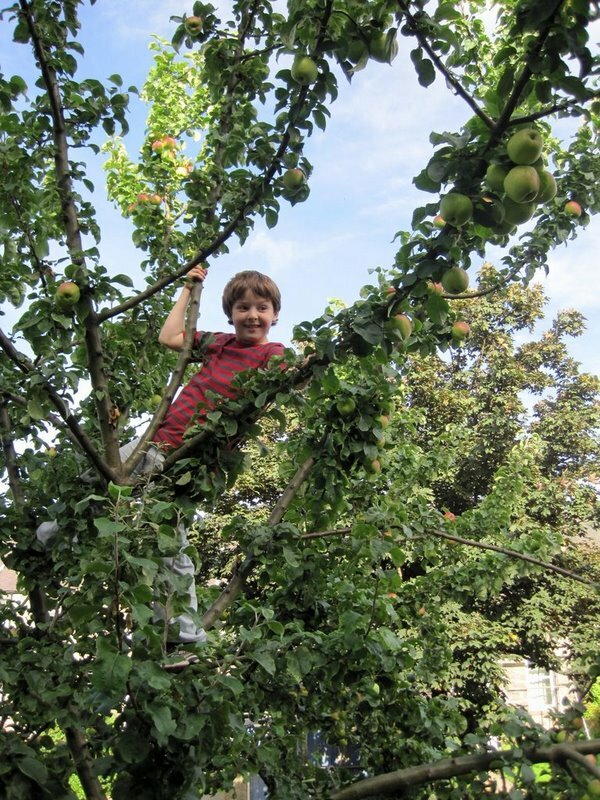 Rachel's son, Calvin, helped us out by climbing the tree to reach those high apples. 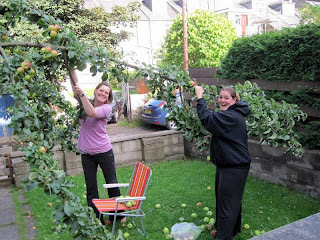 Once we were home, I had two full bags of apples to peel and core. Luckily, Emily loaned us her apple gadget that does just that at the turn of a handle. Wonderful!!! 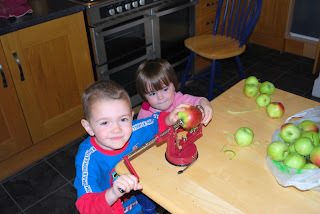 Even the kids enjoyed using it. I have no idea what kind of apples these were; they were a little too tart for eating straight and turned brown in seconds (even my lemon water couldn't keep them white), but these are wonderful baking apples. I made a huge apple crisp and still had three gallons of apples to freeze for a future day. There were enough apples to share with everyone in our group who wanted some. 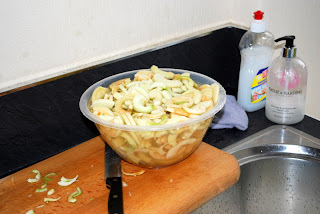 We have been enjoying amazing apple desserts from everyone in our group - pies, crisps, breads, crumbles, etc. And I still have one more bag in the freezer for a future autumn night. Apples are one of my favorite things about fall!!! That looks like a great days collection. Your blog is looking very fine too, Christy! You were too young to enjoy the apple picking time at the Braggs place in Montana. But remember the apple cider making times we had in Eatonville. Apples bring friends together. Oh, I am so glad to see those pictures! I still think about us three grown women hanging on branches and laughing hysterically while we knocked apples onto the ground. 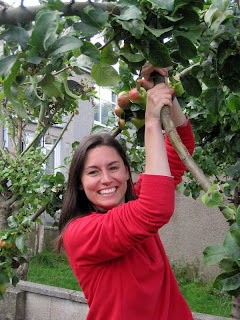 We enjoyed our bags of apples, the peeler, good friends, and a lovely tree. Thanks Christy for such a great post and thanks Lemon for the day. Apples, like friends, come in bunches.